Can power wash with solvent wipe down, light commercial blast, or power hand tool to remove loose flake and debris before applying. Can use power tool ( within the guidelines of Clean Air Act ) with vacuum to prep lead-based paints (as discussed at Steel Structures Painting Council-SSPC-meeting March 15-17, 2001 and attended by EPA and NIOSH) before applying RUSTGRIP® over lead-based paints. Alternative to abatement of lead paints. Surfaces should be clean, dry and sound. Existing surface dirt, oil, tar, grease and film should be removed from surface by approved methods ( TSP-Tri-Sodium Phosphate or equivalent ) prior to application of RUSTGRIP®. MUST BE COMPLETELY DRY or being a moisture cure it will start curing before it has an opportunity to become part of the substrate and could flake off. It is also advised that the Letter from the Oklahoma Department of Transportation be reviewed. Stir product thoroughly before using. RUSTGRIP ® can be applied slowly with soft bristle brush, roller or spray equipment. If spraying use standard airless sprayer (3,000 psi or less) with a .015 tip. It should be applied evenly without buildup at the prescribed thickness. Overly thick application or applying too quickly may cause surface bubbling from gassing. Apply in two coats using crosshatch method ( side-to-side, up and down over same area ). 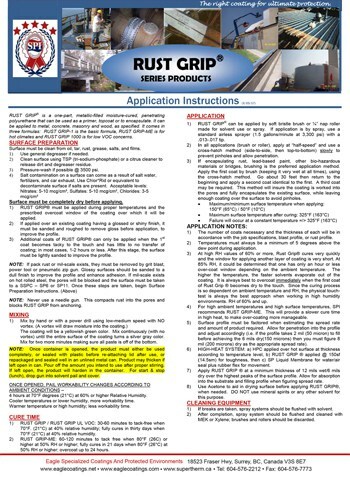 RUSTGRIP ® over RUSTGRIP ® must be overcoated within 4 hours. NOTE : If overcoating with any other paint products, do so within a 2 week time period of initial application of RUSTGRIP ®. It is preferable that the overcoat be applied within a day or two so that they can cure down together. CAUTION: Wear gloves and protective clothing. Extremely tough to clean off skin. Throw away brushes and rollers after use. Wear eye protection. * CLEAN UP IMMEDIATELY OR WILL RUIN EQUIPMENT. SOLVENT: Clean-up or reduction, use MEK or MIBK. If sprayed, keep solvent ready to clean equipment before breaks (lunch hour) or at conclusion of job. May be used by itself without an additional top coat product. Excellent adhesion to wide variety of substrates. Attaches into the pores of metal, concrete or any other substrate and expands to lock in. Cures by reacting to moisture in the air. A portion of a container may be used and re-sealed for later use, if done so carefully and with an air tight seal. A piece of poly between the can and the lid is recommended to prevent them from becoming one and thereby being impossible to open. A skin may form on surface of the product. Remove the skin and use as directed. Non-Rusted Metal, Fiberglass 133 sq.ft / gallon.